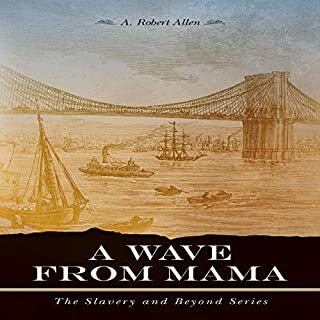 Would you consider the audio edition of A Wave from Mama to be better than the print version? The audio was fantastic, the many voices were crisp and clear. The audio made the whole story light up. The narrator had a distinctive voice for each person in the novel. I liked the audio version with the printed book, I used them together. With the audio the book was outstanding. Listening to the audio made the characters come to life, and I was in the middle of the story not on the side lines. Which character – as performed by Antonio Reyes – was your favorite? I liked the character Moses, he was always helping Venture Simmons out when he got into trouble. I also liked Vent' s girl friend, with the audio I felt there was real love between them. If you could take any character from A Wave from Mama out to dinner, who would it be and why? If I could take a character out to dinner it would have to be Vent' s girl friend, she was friendly, a little shy at first but warmed up to others fairly easy. I enjoyed the book and audio, I learn about the building of the Booklyn Bridge, and about the Irish gangs. I also learned how hard the black people had to work to survive after President Lincoln freed them. Oh, yes one more thing the song 'Amazon Grace' was beautiful and was the high light of the Audio.